Trigger Shot™ uses your Android devices's built in sensors as triggers for taking photos. Included free is the Time Lapse option. This will take pictures based on a time interval. All pictures are added into the Gallery under the "TriggerShot" folder and are numbered and stored on your SD Card at "/TriggerShot/". EMF Trigger - Trigger the camera based on Electro-Magnetic Field values read from the phone's electronic compass sensor. Start and Stop values can be selected. Great for capturing paranormal activities. Vibration Trigger - Take pictures when ever your phone senses vibration above a certain setting. Light Trigger - Trigger the camera whenever light values change. If started in the dark, the trigger will start when a light is turned on. If started in the light, the trigger will start when the light is turned off. Many more sensor modules will be available shortly. Touch the wrench button in the upper right to view the settings and available optional modules. 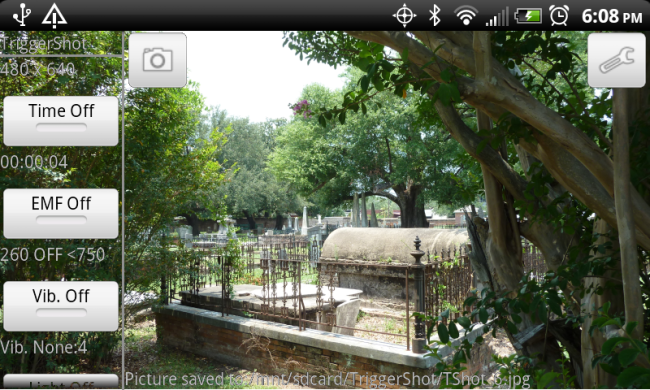 Here is a sample screen shot. The viewfinder is the whole screen, with the trigger controls overlaid. 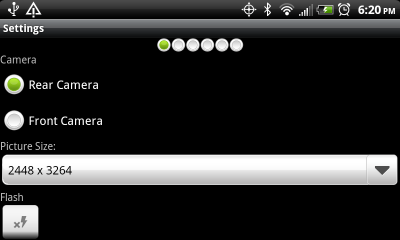 The base settings screen will allow you to set the camera view (rear, or front facing), picture size, and flash mode. The picture size will depend on the Camera selected. 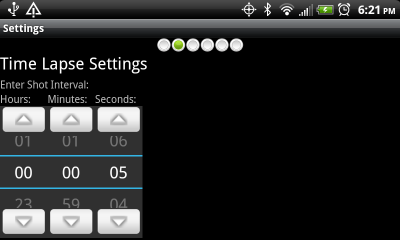 The time lapse settings screen will allow you to set the interval between shots. Some phones will not be able to take pictures below about 5 seconds. A message will be displayed if the camera can't keep up with the app. Click the links above for more information on the Optional Trigger modules.